King Machine will attend 19th International Exhibition "Food Industry"
Dear friends, We are coming. We hereby sincerely invite you and your company representatives to visit our booth in Uzexpocentre NEC. 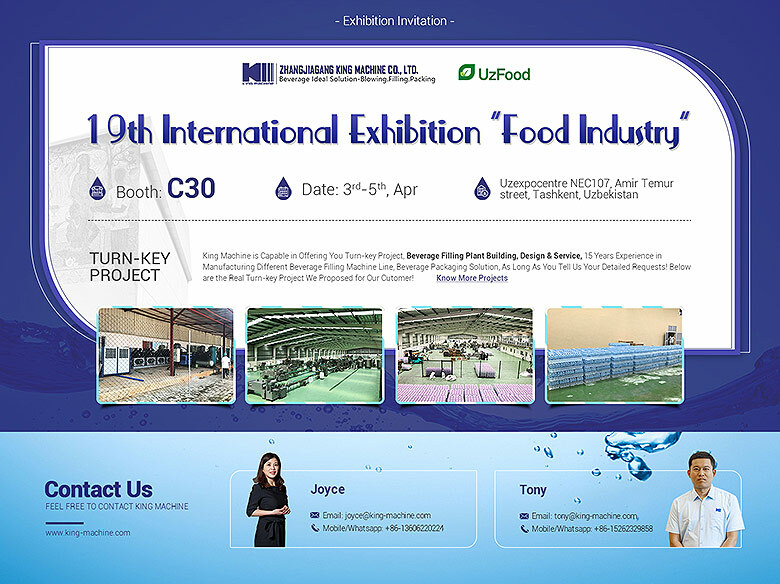 Exhibition Name called 19th International Exhibition “Food Industry”.It Will be held in UUzexpocentre NEC 107, Amir Temur street, Tashkent, Uzbekistan from April 3-5 2019. King machine is a professional supplier and manufacturer of filling machinery,different beverage filling machine,filling line,beverage packaging solution. With the rich experience and professional produce, our products’ quality always meets the high standard requirements of our customers.We are very much expecting to establish a long term and good business relationship with you in the near future. So, We hope to meet you at the exhibition so that we can introduce our products to you.